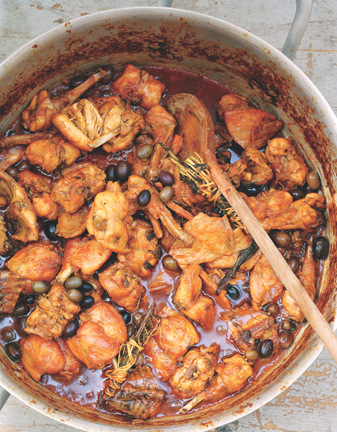 Cooked stove top, this bright, rich stew will perfume your home with the heady scent of rosemary, olives and red wine. 1. Season the rabbit pieces with salt and pepper. Heat enough oil to coat the bottom of a large skillet, about 3 tablespoons, over medium-high heat. Working in batches, brown the rabbit pieces, about 3 minutes on each side, then set aside in a bowl. tender, about 15 minutes more (if the meat pulls easily from the leg bone, the rabbit is done). Adjust the seasoning with salt and pepper, reduce the heat to low, and cook for 5 more minutes to allow the seasoning to penetrate. Serve warm in shallow bowls.